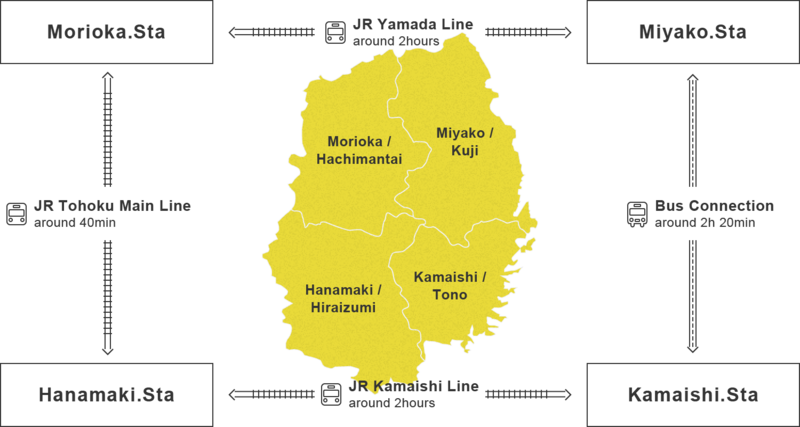 Iwate Prefecture can be divided into four distinct areas. The northwest area is centered around the prefectural capital, Morioka. The city has urban appeal with a large number of sophisticated restaurants and shops, and yet not far from the city limits it is also surrounded by abundant nature including Mt. Hachimantai. The southwest part of the prefecture that includes Hanamaki City is dotted with historical and cultural hotspots, while the northeast area around Miyako City features a stunning coastline. At the heart of the southeast area is Kamaishi City, which boasts Japan’s only collaboration with vacation rental site Airbnb. It also includes Tono, “The City of Folklore”. Each area is served by rail. 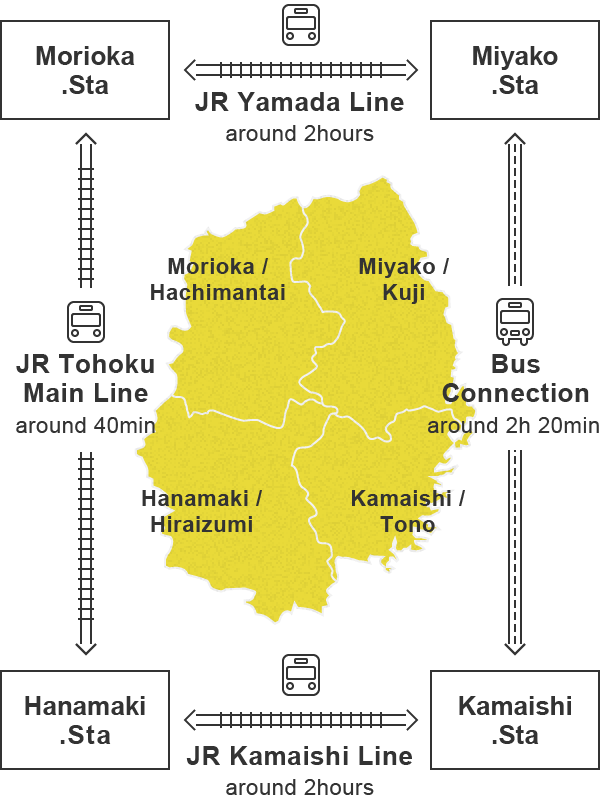 The East Japan Railway Company (JR-East) Tohoku Main Line links Morioka and Hanamaki, JR Yamada Line serves Morioka and Miyako, and the JR Kamaishi Line runs from Hanamaki to Kamaishi. The line from Miyako to Kamaishi has been out of service since the Great East Japan Earthquake disaster, so it is currently served by bus. Means of transport around the prefecture are train, bus, rental car and taxi. Travel between the east and west sides of Iwate by public transport such as train and bus is limited to certain routes, so it is recommended that you check access to your destination ahead of time as car rental may be required. JR lines run all across Iwate. In addition, the Iwate Galaxy Railway connects Morioka with Kintaichi Onsen in northern Iwate and beyond to Aomori, while the Sanriku Railway runs along the Sanriku Coast, starting from Miyako and Kamaishi. JR and the private railways offer special tickets to foreigners traveling to and within Iwate by train, which you should certainly take advantage of for rail travel. For an overview of the tickets issued by JR, please visit the website Travel to Iwate. Another option is the Tohoku & Hakodate Local Rail Pass, which allows unlimited travel in unreserved seats on local and express trains of 13 rail companies with lines in Tohoku and Hakodate, including Iwate Galaxy Railway and Sanriku Railway. The Tohoku & Hakodate Local Rail Pass is currently only available to Taiwanese travelers through travel agents in Taiwan, but it is expected to be made available to other regions especially Asia in the near future. The following three bus companies run services between the cities of Iwate: Iwateken Kotsu, JR Bus Tohoku and Northern Iwate Transportation. Their websites are only in Japanese, but you can search travel times and prices on bus routes between the cities and towns by exploring Google Maps. Meanwhile, some city bus networks are searchable on Google Maps, others are not. Please check access details for each tourist spot, which can be found on this website. Japan’s leading car rental companies such as Toyota Rent a Car, Times Car Rental and Nippon Rent-A-Car provide online car booking systems in major languages. Each company has branches near major train stations and airports, so check their websites before you go. A highly recommended app for foreign drivers is Drive@TOHOKU (only available for Android). Drive@TOHOKU presents you with information to solve problems that can bedevil new drivers in Japan such as the right lane to drive in, road signs, gas stations and parking. The app also provides information about nearby tourist sights and how to get there. For details, please visit the app download page . Some rental car agencies offer rental service of tablets with the app installed. Taxis are convenient for areas without bus service or where buses are infrequent. Taxi stands are found at the roundabouts outside train stations, so join the line and get in a taxi here. In locations without a taxi rank, flag one down on the street. Make use of apps that enable you to call a taxi to your current location. Visit the Japan National Tourism Organization (JNTO) website for apps and tips for catching taxis. Many taxi drivers in Japan do not understand English, so ensure a smoother ride by preparing your map or destination address before you get in.